Keith arrived in North Korea by way of the large and prosperous Chinese frontier city of Yenji whose population is 60% Korean; money-laundering is allegedly a major industry! His visit, in October 2015 was arranged by Juche Travel Services, one of several companies providing study tours to this fascinating country. 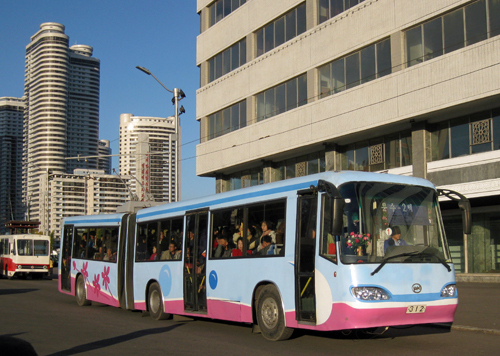 A modern trolleybus in Pyonyang. The North Korean travel document was a one-page tourist visa, issued on completing a one-page application form; China required 4-pages! Pre-tour advice was never to photograph the military or people at work, never to cut off the legs of Kim Il Sung and Kim Jong Il (otherwise the Great Leader and Dear Leader) if photographing their ubiquitous statues, never to photograph anything which might give a poor impression of the country and never take photographs when instructed not to. It was also forbidden to go out without the company of a tour guide. The tour guides for the group of over thirty, mainly British and German, adopted a light touch and were charming and helpful throughout. Tour vehicles, some quite modern were mostly Chinese in origin, trade continuing despite UN sanctions. 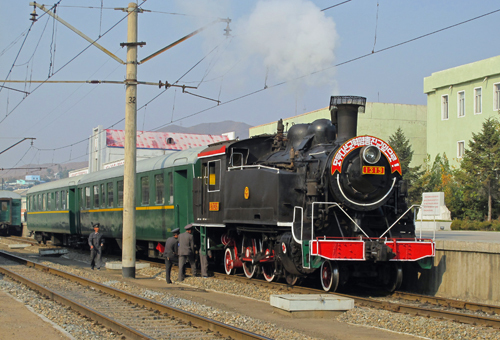 The journey was north-south, from the Chinese border, through the Rason Special Economic Zone to eventually reach Pyongyang by a special train including two carriages second-hand from the Swiss BLS railway. At Rason the local guide after taking the party to pay homage to the first of several flower-bedecked statues of the leaders included in the itinerary proudly showed them the "Golden Triangle Bank" a seemingly unusual tourism feature very much in western style; inside however the posters remained militaristic in the old Soviet style. So too were those in schools one particularly violent one showing troops zapping Americans and Japanese adversaries during the Korean war of the 1950s. Rason harbour was visited; dockside security seeming minimal compared with similarly important UK ports, this being a major centre for oil imports from China and the trading of coal with Russia using a broad gauge rail connection to the nearby border. Other visits on the city tour were a textile factory probably subcontracting to Chinese companies and a brew-pub offering excellent beer, a North Korean speciality. Noted too was a huge hotel with casino again catering for the Chinese market as gambling is banned everywhere in China except Hong Kong and Macao. On the standard gauge railway much of which is electrified at 3000v DC, semaphore signalling could be seen in places along with signalboxes of traditional appearance and ground frames for working points. Older electric locomotives were either Skoda-built or converted from Soviet era diesel-electric locomotives; more modern ones are believed to have been locally assembled. Diesel locomotives often second-hand were either of Chinese or Eastern European build, both diesel electric or diesel-hydraulics. As in UK many ran under the wires. Every station carried at least one image of the late Leaders. A steam train at Chongjin. At Chongjin, following a short trolleybus tour the group were surprised to be offered a steam train ride with lots of photo opportunities using a tank engine normally operating in the local steel works. This city also boasts a tram line worked by Czech built Tatra T6 vehicles. Various images were recounted-a military-vehicle train ("accidentally" photographed) which had stood so long in a station that soldiers had lit fires underneath the flat trucks to stay warm with improvised underfloor heating; lorries in rural areas powered by charcoal gas emitting copious smoke from behind the cab; a conductress standing on the rear of a moving trolleybus to provide tension on the trolley-poles; traffic police controlling major junctions despite traffic being almost non-existent; huge hotels with few guests and occasionally smart men in grey suits and sunglasses making little effort to look other than secret policemen! Hydro-electric power generation was shown as well as coal-mines, and strip-fields of vegetables along the lineside growing as vines might do in Europe. Kimchi is the national Korean dish, cabbage fermented in a spicy liquid. Fish and even Spam are popular dishes with dog soup more of a luxury. Television broadcasts on just one channel, except at weekends when there is a second to show sporting or other special events. There is no internet nor international calls, but 3G broadband encourages mobile phone usage particularly in cities and the guides made good use of this facility. At Myohyangsan in a mountain region north of Pyongyang reminiscent of New England in the fall, the International Friendship Museum contained thousands of gifts to the Great and Dear Leaders from other heads of state. Mao and Stalin had presented railway carriages, the ever generous Stalin armour-plated limousines and even an Ilyushin 14 aircraft which was similar to a Dakota. Amongst the more bizarre smaller items was a stuffed alligator from Nicaragua formed into an occasional table! After five days of rail travel Pyongyang was reached. Nothing here predates the end of the Korean war in 1953. A modern and sometimes not unattractive city there are various interesting buildings including an Arch of Triumph in the style of its Parisian namesake commemorating the Korean resistance to Japan from 1925 to 1945. "Pyonghattan" is the new high-rise residential area for favoured citizens and Government officials including a Shard-like hotel commenced in 1989 but still awaiting completion. Keith stayed in the Koryo Hotel patronised by Michael Palin in his recent Television programme, which is topped by a revolving bar. Kiosks have made their debut on main streets, as well as a department store which is adjacent to the "Grand People's Study House" which turned out to be the city's main library! Moored beside the Victorious Fatherland Liberation War Museum is the US intelligence vessel "Pueblo" escorted into Wonsan in January 1968, which remains the American Navy's oldest commissioned ship. Opened in 1973, the Pyongyang Metro is the deepest in the world, the tunnels doubling as nuclear shelters. Keith's party was able to visit nearly every station on the two public lines, but there have been rumours of a third one, available only to party officials Stations are reminiscent of those on the Moscow Metro. Rolling stock was originally Chinese-built, but in 2015 consisted of ex West Berlin U-Bahn trains. Prior to these some ex East Berlin stock was tried but these sets were cascaded to the main line railway. Today brand-new trains are in course of delivery. Tram 1002 - built new for the opening of the tramway and said to have been used by Kim Il Sung on opening day. 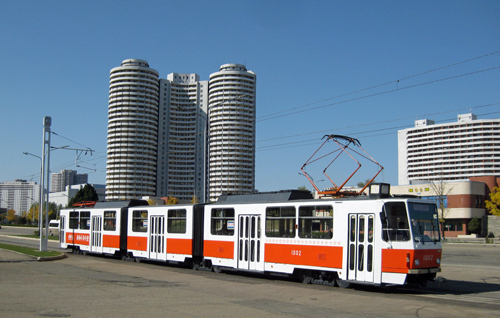 Standard gauge trams came to Pyongyang in 1991, using again Czech built Tatra cars with many second-hand ones subsequently acquired from Prague, Leipzig and elsewhere. There are three lines one of which has been cut back owing to a weak bridge. Infrastructure seemed in quite good order. A practice on trams and trolleybuses is that each driver is allocated his/her own vehicle, with one star displayed for every 10,000 km of safe driving. At the end of a shift another vehicle takes over the schedule. A separate metre gauge tramway to the mausoleum of the erstwhile Leaders using former Zurich trams was out of bounds to visitors. The large trolleybus fleet includes modern locally built articulated vehicles, older eastern European models and some elderly heritage buses. Again new rolling stock is being delivered according to internet reports. An excursion was made to the DMZ which is frozen in time, but visitors can pose round a table down the middle of which the border with South Korea runs. Inside the DMZ a goatherd was photographed guarding his flock while sitting among tank-traps. The tour culminated in nearly 24 hours on the Pyongyang-Beijing Sleeper taking Keith to the very different world of the Chinese capital where sleek modern Metro cars call behind sliding doors and traffic jams abound. From there it was by high-speed rail to Guanzhou which has battery trams recharged from overhead equipment at stations and finally to Hong Kong and a world made more familiar by Walter Alexander and Wright bodied double-deck-buses. Report by John Yellowlees. Photographs by Keith Jones.